Comes In Nice Special Fold-Out Sleeve..! En avant la Zizique!, in collaboration with Éditions du Trainailleur, presents a true immersion in old Chicago with the real father of rock 'n' roll! In 1954, a young truck driver cut a bunch of singles in Sam Phillips's famous studio in Memphis, Tennessee; "That's All Right Mama" was one of the songs recorded, and it ended up on the first 7" released by a certain Elvis Presley. Within few months, the latter's name was on everyone's lips as the record entered every jukebox in the country as well as radio stations, the rock 'n' roll wave inundating the culture of millions of Caucasian youngsters. Eight years earlier in Chicago, a blues singer from Mississippi, a straight guitar player with an exquisitely expressive voice, cut a personal creation titled "That's All Right," this after having made a first draft in 1945 under the title "Dirt Road Blues." 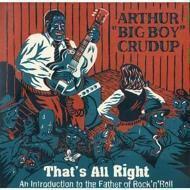 Backed by a solid rhythm section, Arthur "Big Boy" Crudup had indeed, by doing so, signed the original of what later became a great rock 'n' roll standard. All the ingredients are already there -- the breaks, the riffs, the line-up, the chords, and the tempo -- confirming Crudup as the original composer of this tune. This devastating hit was so lucrative for Presley that he recorded two more of Big Boy's masterpieces -- "My Baby Left Me" and "So Glad You're Mine." There's no question of Presley's charismatic interpretation, or of his highly praised musical references. However, it is common knowledge that neither the king nor the producers nor the managers had made public the name of Arthur Crudup. With this release, the connoisseurs will once again recognize the magic of these post-war blues sessions -- and everyone else will definitely get hooked. That's All Right: An Introduction to the Father of Rock'n'Roll contains ten tracks from a forgotten hero without whom the rock 'n' roll revolution would surely have taken a different path.